Life Link Training Institute was established in 2003 as the education and training component of The Life Link, a 501(c)(3) nonprofit located in Santa Fe, New Mexico. We focus our efforts on disseminating evidence-based practices in the behavioral health field. Life Link Training Institute is pleased to offer a wide range of training in the field of mental health, substance abuse, and non-clinical topics at times. We offer training on some of the best behavioral health treatment modalities and include CEU's on a regular basis for mental health and substance abuse counselors as well as social workers. We also offer training in NIDA/SAMHSA blending products. We offer many trainings at our home base in Santa Fe, NM as well as travel nationally and internationally. The Life Link was one of a few community treatment programs in New Mexico associated with the Southwest Node (CASAA of the University of New Mexico) in the Clinical Trial Network (CTN). The Life Link was an active participant in the CTN from 2000 to 2015. The CTN is funded by the National Institute on Drug Abuse (NIDA). Want to have more staff trained, but can't afford all of the costs outside of the registration? Many of our courses can be done at your site at a steep discount to the per person cost rate. Discounts typically are seen starting with approximately 12-15 people. Others may be invited from the community to increase attendance! 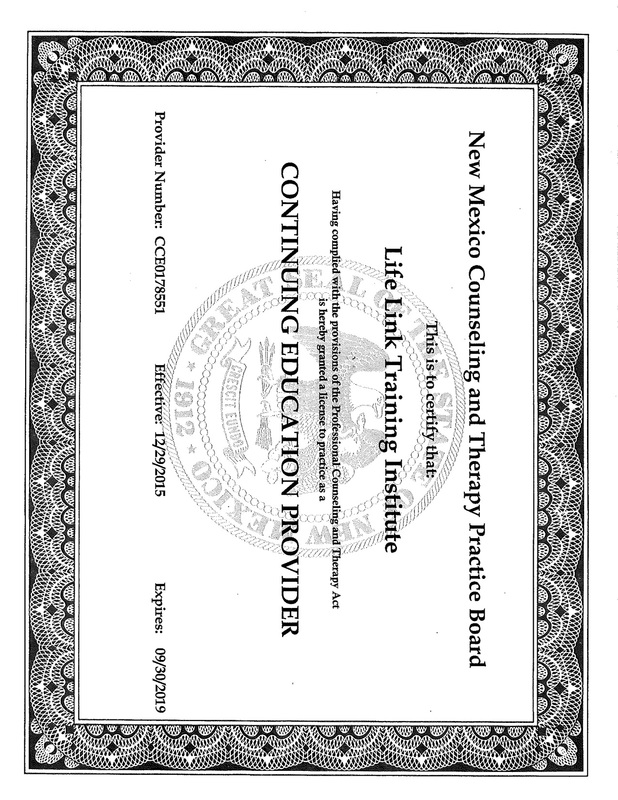 Life Link Training Institute has been a New Mexico CEU provider since April of 2004. We typically cover CEUs for those who are Social Workers, LMFT, LPCCs, ﻿L﻿PCs, LADACs, CPSWs and CHWs. We typically do not provide CEUs for nurses or psychologists.